Home Forums Harmony Navigator Bug Reports Continuation not working? As far as I can tell, Continuation coloring is not working properly in Palette. I set Strong to Red and Weak to Green, and turned off all other Coloring. It sets all outer chord boxes not on the horizontal scale to dark green and all inner ones (contained inside another chord box) to light green. Those on the horizontal scale are either the same shade of light blue or white, though it's not clear which it's claiming are more statistically likely---I'd guess the light blue, though that would imply that the movement from I to iii is as statistically likely as I to V and more likely than I to ii, which I know is wrong (I just reviewed the research). Can you attach the palette file to a post so we can have a look? It seems to start working after I click on a chord other than the initial chord. But a sequence consisting only of the same chord in a row gets no recommendations, and the last chord selected is always rendered as blue so I can't see its Continuation color. Any suggestion based on less than two (three actually) previous chords would be random. Therefore the system kicks in only from the third chord onwards. The continuation map behind this was trained on thousands of existing pop, jazz, r&b, etc progressions. No manual post processing was applied to the results (no "rules"), so it's well possible that some surprising suggestions may arise. If you are looking to create a progression with popular appeal, the fastest path is to pick one from a song book (there is no copyright on chords) and merely change its rhythm. IIRC, there aren't more than a dozen, of which the first three or so make up 80% of the global popular corpus. Or, in other words, all popular music is based almost on the same four chords. 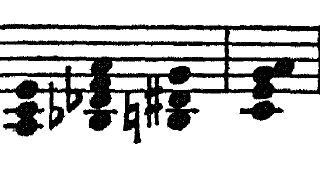 Therefore the original motivation of the continuation scheme was to encourage the use of relatively unexpected chords that still make up a pleasant listener experience. Still, in the key of C, if I click C, F I don't get G as a suggestion here. Although T-S-D is a very common progression. Regarding your palette file: If you want the suggested chords to appear green, you'll need to reverse the color spectrum. Currently green indicates the opposite. What a coincidence! I was just about to open a new thread on this topic! Would it not be possible to add, over time, external libraries of chord sequences classified by type and to be used with the Continuation scheme in any palette? Would it make sense an option that allows you to re-arrange the palette in chromatic order from weak to strong or vice versa, regardless of the position of the chord in the scale? Fair enough. Obviously it could be extended (statistical analyses of user input midi sets, or online databases of popular chord progressions in different genres changing over time), but all that's very low on the list of features I'd like in the future... really looking forward to intelligent humanization. Building a database of harmony information on these is a huge task (unless it is already available). Also, what distinguishes these styles, and concepts of weak vs. strong, happy vs. sad, calm vs. excited, heavily depend on things other than the progression of chords. Basically, a chord is merely a byproduct of multiple melodies going along. I bet you will find the same progressions used to a totally different effect in different styles. I bet you will find the same progressions used to a totally different effect in different styles. Actually, I was thinking of a database of harmonic clichés. is quite common in the music of Debussy and could be embedded (also) into the library "Impressionists". All of the Bach Chorales is another collection of progressions, presumably available as MIDI files, that springs to mind. It doesn't have to be an encyclopedia in twelve volumes: maybe just a few suggestions divided by genre. Alternatively, would it be conceivable to create a shared database of harmonic progressions to be "teached" to Synfire? If many of us contribute, data entry's work can also be relatively light. Thanks for the link. Inspiring stuff. But these two chords don't get you anywhere unless you know how to orchestrate and put them in context. For inspirations like this, a library would be the best fit. Instant drag & drop use.